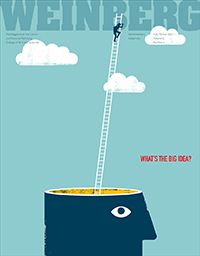 Weinberg magazine welcomes letters to the editor. Please email your comments to weinberg-communications@northwestern.edu. Comments may be edited for grammar and brevity. Get the latest news: follow @WeinbergCollege on Twitter. "The Domestic Arts and Sciences"
Thank you for the article “The Domestic Arts and Sciences” in the fall/winter 2017 issue of Weinberg magazine. We [home economics students in the 1960s] were blessed with Ruth Bonde as chair of the department and Hilda White as a professor of nutrition. Professor White had a Ph.D. in biochemistry and had done fieldwork in South America, so she was extremely knowledgeable about both the science and significance of nutrition. Since the home-ec majors took chemistry classes with the chemistry majors and the pre-meds and enrolled in the same economics classes as the econ majors, we were superbly prepared. I graduated Phi Beta Kappa in 1965 and earned a master’s degree in nutrition in public health at Penn State. I currently work with special-needs children from low-income families as a community dietitian with the Ohio Department of Health. My Northwestern education has been invaluable. As our medical community becomes more aware of the importance of nutrition in the prevention of chronic diseases, I would love to see Northwestern offer nutrition courses again. Regarding the concerns raised in the article “Undemocratic Democracies”: A small step forward would be the imple­mentation of ranked choice voting, as recommended by the group FairVote. Ranked choice voting allows for real-time runoffs, ensuring that unpopular candidates are not elected via pluralities. This approach can apply to voting at all levels of government and would not eliminate our presidential electoral college. — JAMES FLOYD ’67 Hope, N.J. I was surprised to open the most recent issue of Weinberg magazine to see a picture of a chimpanzee with a Donald Trump campaign hat. I think that no matter what your political leanings are, showing this in Weinberg magazine is disrespectful, even if a Northwestern professor had written about the similarities [“It’s an Alpha Male Thing” by Professor of Psychology Dan McAdams]. When in these situations, I like to imagine what the reaction would be if the parties were reversed. In this instance, I can’t imagine Weinberg would publish it. — JOHN MULTHAUF ’93 Orlando, Fla.
One of the things that made Northwestern particularly special for me was the professor under whom I majored, Professor [of Religious Studies] Edmund Perry. At the beginning of the first class I took with him, he told a joke. I have not the slightest recollection of the punchline, but I do remember it was a joke about a priest. A hand in the class flew up and a student said, “Dr. Perry, I am Catholic, and I am greatly insulted.” There was a long pause, and Dr. Perry said, “Well, let me answer that. If you remember nothing else from this class, please remember this: Any time you take yourself so seriously that you can no longer laugh at yourself, it has become demonic.” I consider that statement to be the most valuable lesson I learned in college. I fear this is a lesson long since lost by the people who make up the college communities of today. I can think of no better way to recover it than for the College to de-emphasize the political correctness that has imbued so much of what it does. Banish identity politics. They are tearing the nation apart. Reemphasize the many academic disciplines in which Northwestern and its students excel, and once again learn to laugh and to share that laughter with others. — JOHN KELLEY '59 Shelburne, Vt.